A long long time ago, Lon was engaged before to someone other than me. I know! The nerve! Ok, I was engaged to someone else before Lon too. Both happened and ended years before we met each other so no worries. The good part of this story is that Lon learned a lot about Latin cooking from his ex-fiance’s Ecuadorian family. He makes really great Spanish rice, works magic with pepper-based sauces, and knows his way around the Latin menus. 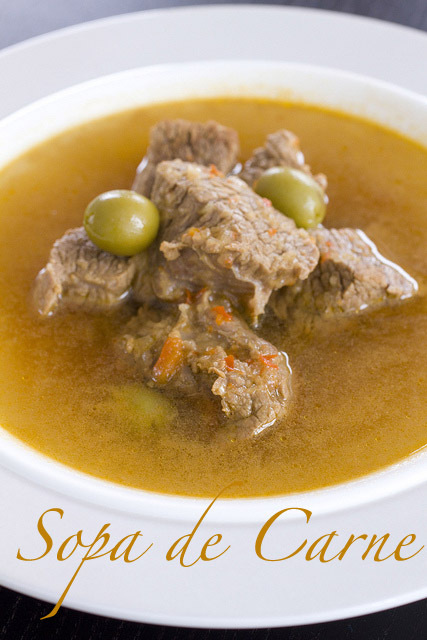 He’s been telling me about this beef soup with olives for a while and I’ve never had it. As usual, it takes forever before he gets around to making it. (Hint Hint Lon: where’s my Espresso Cheesecake?) Only this time, he had the recipe on the computer so I made it. It’s one of those super easy, peasant-style dishes. Having never made it before or even tasted it before, he assured me it would be no problem. He continued to tap away at the computer and checked on me periodically. Really, it was no sweat, just some waiting time, and we had a soothing winter lunch. 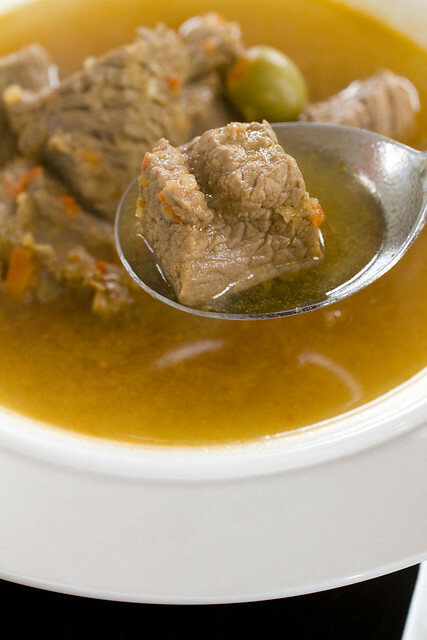 While the beef and olives impart rich and bold flavors, the soup is broth-y and unexpectedly light. It doesn’t look or feel greasy. It’s a great start to a meal or throw in some bread and it’s the total package. 1. 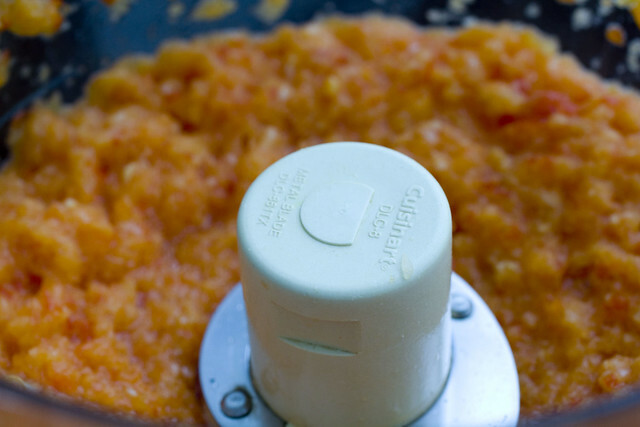 Place bell pepper, onion, garlic, and 1/4 teaspoon salt in a food processor and process until minced. 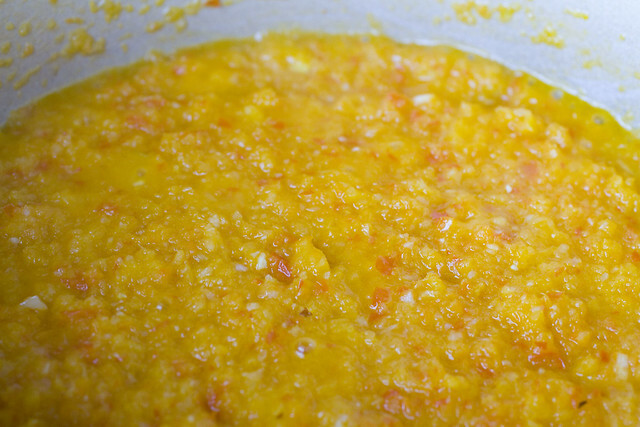 Now you have sofrito. 2. Heat oil in a large pot on medium heat. 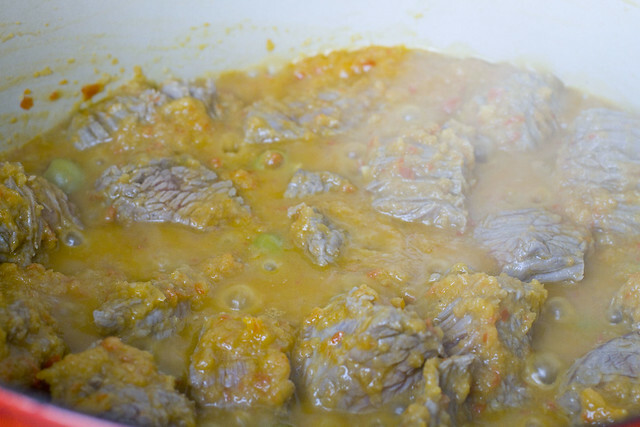 Add sofrito and stir until golden. Allow it to cook down a bit, reducing the moisture, about 8 minutes. 3. Add beef and olives. Brown beef on all sides. 4. Stir in broth and bring to a boil. Turn down to a simmer and simmer covered for 1 hour. Skim skum off the top and serve. Left-overs can be stored in the refrigerator or freezer and reheated on the stove top or in the microwave. posted by jessica	at 10:00 AM	Filed under Latin, Recipes. You can follow any responses to this entry through the RSS 2.0 feed. Both comments and pings are currently closed. That looks like it would hit the spot on a cold day! Definitely keeping this recipe on my “to do list” of winter soups! This soup looks wonderful! Perfect for a winter day. Oooh, I love the salty olives and beef combination. this blog is not what it used to be. Q, sorry you feel that way. Can you elaborate?